This is one of my favorite recipes for stuffing. Unlike almost every other recipe for Thanksgiving, this one I make year after year because I love it so much. 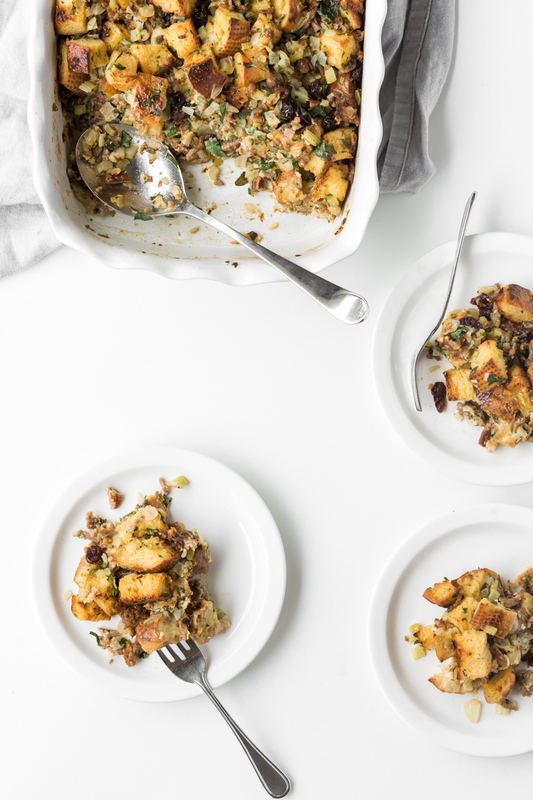 I always experiment with the turkey, or potatoes, or cranberry sauce, but when it comes to stuffing— this has become my go-to recipe. It’s rich enough to feel decadent and festive (it is Thanksgiving after all, live a little), but it’s not so heavy in butter and cream that you feel sick after eating it. Over the years of making this, I’ve made a few minor changes from the original Gourmet recipe, simply out of personal preferences. The sour cherries are my favorite part so I bumped them up a little bit, and I bring the garlic down to 2 cloves so it isn’t too overpowering. I also love to use sourdough-- the slight tang adds a lightness to the stuffing and lifts the rest of the flavors, but feel free to use challah or other egg based bread if you prefer. I also always go for hot Italian sausage whenever I have the chance, and the hit of spice is a wonderful contrast to the sweet and tart cherries. Like any stuffing, you can add what you want to this—I throw in a few peeled and diced granny smith apples on occasion, cranberries can be used in place of tart cherries if you can’t find them, walnuts for pecans, etc. But if you can, make it as is for your first go around. 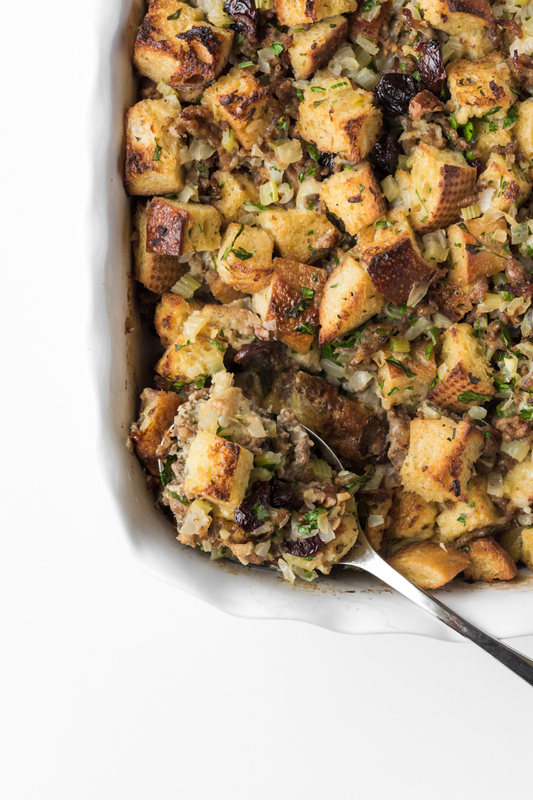 It’s a simple and incredibly satisfying stuffing that we look forward to every year. Sometimes I even make it for Christmas. Heat oven to 350°F with rack in middle. Generously butter a shallow glass or ceramic baking dish (3 1/2 to 4 quarts in size). Roast pecans in a pie or cake pan until fragrant and insides are pale golden, 8 to 10 minutes. Let cool, then coarsely chop. Divide bread between 2 large baking sheets and bake, switching position of sheets halfway through baking, until golden, 15 to 25 minutes. Meanwhile, heat oil in a 12-inch heavy skillet over medium-high heat until it shimmers, then cook sausage, stirring and breaking up lumps, until browned, about 5 minutes. Transfer sausage to a very large bowl. Add butter to skillet and heat over medium heat until foam subsides. Add onions, celery, garlic, allspice, and 1/2 teaspoon each of salt and pepper, and cook, stirring occasionally, until beginning to brown lightly, 12 to 15 minutes. Add vegetables to sausage with bread, cherries, and pecans, and toss to mix well. 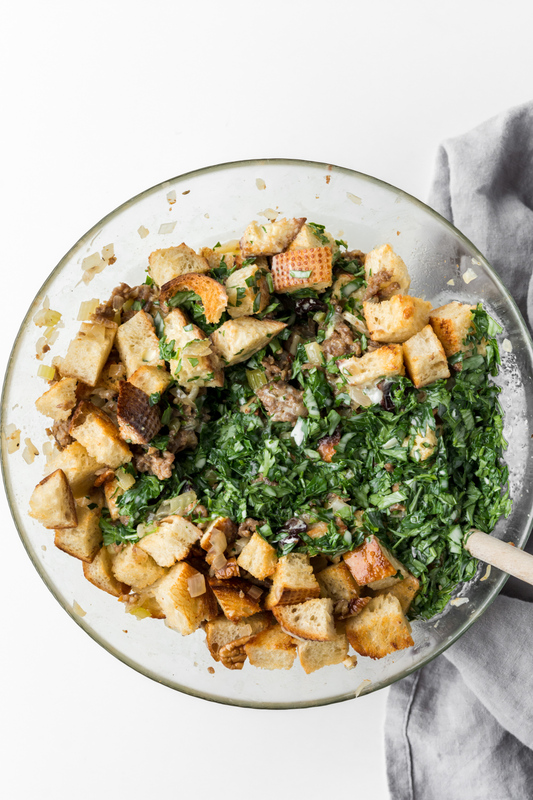 In a medium bowl, whisk eggs, then whisk in stock, cream, and parsley, and pour over stuffing. Stir stuffing well, then spread it out in baking dish. Chill if turkey is more than 1 hour from being done. When turkey is done, increase oven temperature to 425°F. Cover stuffing tightly with foil and bake until hot throughout, 20 to 25 minutes. Remove foil and bake until top is golden brown and crisp, about 10 minutes more.